BEIJING: China on Friday hailed its historic mission to the far side of the moon as a “complete success” so far but said new challenges await its rover as it explores rugged terrain, reports AFP. The Chang’e-4 probe—named after a moon goddess—made the world’s first soft landing on the moon’s “dark side” on January 3, a major step in China’s ambitions to become a space superpower. A rover dubbed Yutu-2 — or Jade Rabbit, the name of the moon goddess’s pet—successfully separated from the lander and drove onto the moon’s surface about eight hours after landing. 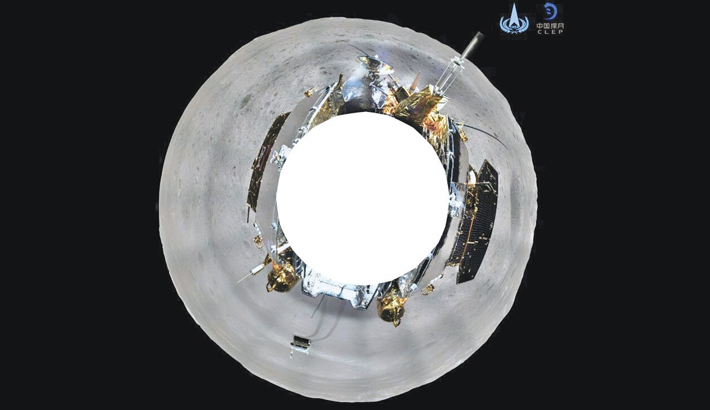 “From the panorama, we can see the probe is surrounded by lots of small craters,” said Li Chunlai, commander-in-chief of the ground application system for the Chang’e-4 mission, according to the official Xinhua news agency. Chang’e-4 landed in the Von Karman Crater within the South Pole-Aitken Basin. The basin is the largest and deepest impact crater in the solar system. The craters close to the rover—including one that was 20 meters wide (65 feet) with a depth of about four meters (13 feet) — will pose great challenges when planning its route, Li said. The China National Space Administration (CNSA) said the initial stage of the mission was a “complete success” after the lander and the rover sent back images via the Queqiao relay satellite that beams data back to Earth. The mission would now “progress to the scientific exploration stage,” the space agency said in a statement. A video of the latest mission’s landing—produced using more than 4,700 pictures taken by a camera on the probe—showed a “thicker layer of dust” offering “strong evidence” that its landing area is much older than the site where China’s previous rover landed, Li said.